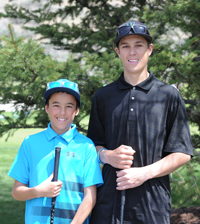 Andrew Nelson (left) and Zach Nelson, sons of James and Bunny Nelson, enjoy the May 17 golf tournament at The Valley Club. Twenty-four teams of golfers toured The Valley Club on Saturday, May 17 for the fourth annual James Nelson Memorial golf tournament fundraiser presented by the Wood River Baseball and Softball Association (WRBSA). Winning foursome in the scramble consisted of Daniel Hollis, Joe Pastor, Ryan Still and Barrett Molter. Posting the highest score were Jon Hoopes, Shane England, Mark Lube and Randy Patterson. Proceeds benefited the WRBSA as well as the Zachary and Andrew Nelson College Fund. They are the sons of James and Bunny Nelson. Zach, 15, is a Wood River High School freshman and Andrew, 12, is a sixth-grade student. Mike Brunker won Longest Drive. Christian Nickum won the Closest to the Pin. Staged by the WRBSA for 11 years, the benefit golf gathering for a fourth year was named for valley baseball supporter James Nelson, who died March 19, 2011 at 42. He was the youngest brother of five boys plus four sisters in Ray and Marian Nelson’s Hailey family that founded the Ray Nelson Little League baseball tournament in the early 1970s. Check the June 4 Local Life for more tourney photos.